British photographer James Balston has been shooting architectural and home interiors projects for over 15 years. As a regular contributor to national and international magazines, he has seen his work appear in publications including House & Garden, Grand Designs and in books by Terrance Conran and Vinny Lee. In recognition to his past life as an interior designer, James is a long-standing industry partner member of the British institute of Interior Design. For his profile picture James chose his photo of a house in France: "This is a beautiful house in France which was renovated by a British couple who are antique dealers. Much of what I shoot day to day, is brand new; sharp, bright and polished to perfection, the latest addition to a designer or architect's portfolio. So it's a bit of a treat to shoot something so ancient. 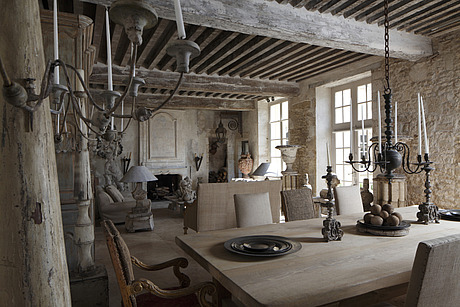 The room is in a house which used to be the residence of the Bishop in the Normandy cathedral city of Sées. It positively oozes history! What I particularly enjoyed about shooting this room, was its almost monochromatic palate, and subtlety of tone. The lack of colour is more than compensated by the variety of texture. "